Yesterday I took the whole health food kick to a completely new high (or low, depending on how you look at it). 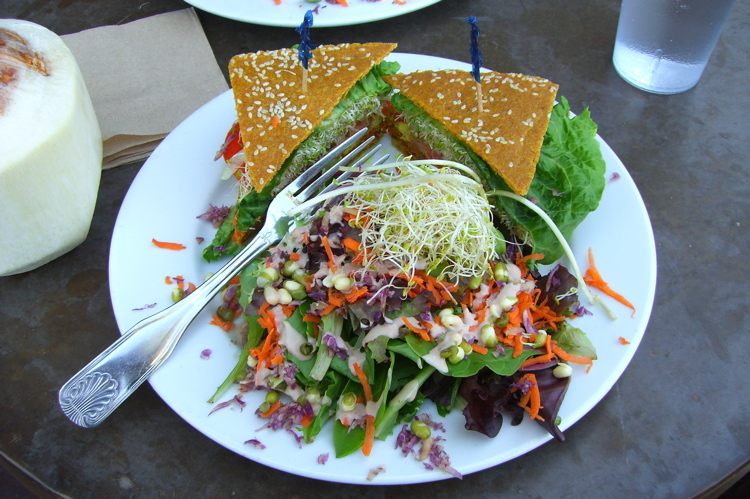 My little sister was down from UC Santa Cruz for spring break and suggested that we hit up this little raw, vegan, organic restaurant called Leaf Cuisine. My first impressions of Leaf were positive. Alishia and I were warmly greeted by a nice girl and guy behind the counter who were very knowledgeable about the food and let us know what dishes were most popular. 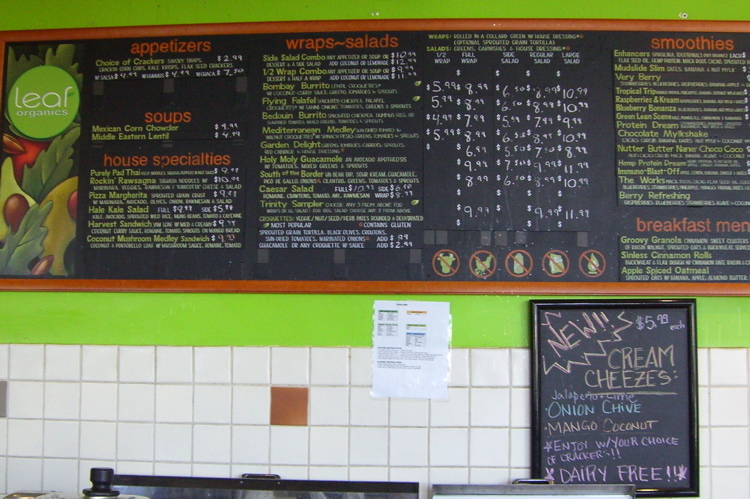 The menu is pretty diverse in flavor, but almost everything is raw and/or vegan. So I ordered my Flying Falafel as a wrap, and Alishia got something called the harvest sandwich which comes with something called an “unturkey” patty. I was told that instead of frying the falafel for my wrap, as is customary, that they dehydrate it instead. All I was hearing was falafel though, so this went in one ear and out the other. Our food was out quickly and actually looked very good. Bottom line, I had two major problems with my wrap. 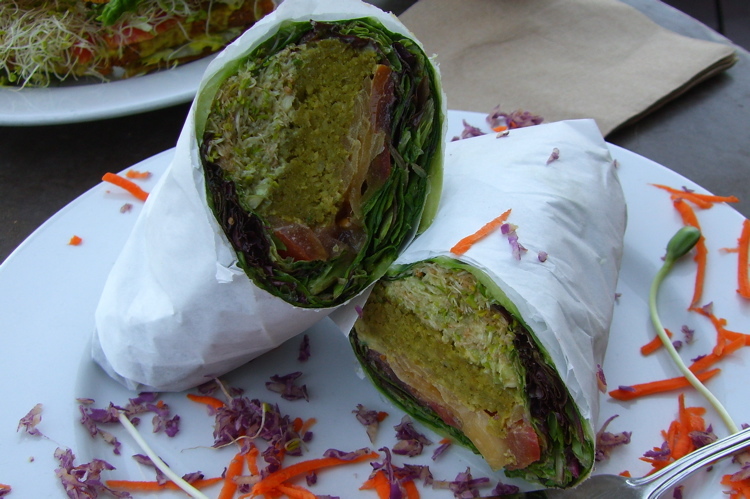 First, the wrap lettuce was extremely waxy. It felt like I was eating the paper they had wrapped it in when it got to the table. Second, the tahini sauce beat the crap out of any other flavor, period. It was so strong that I had to pace myself on how big of a bite I could take. I honestly didn’t even make it through the first half of the wrap. Alishia liked her sandwich and offered to give me a taste, but I was too jaded for that. 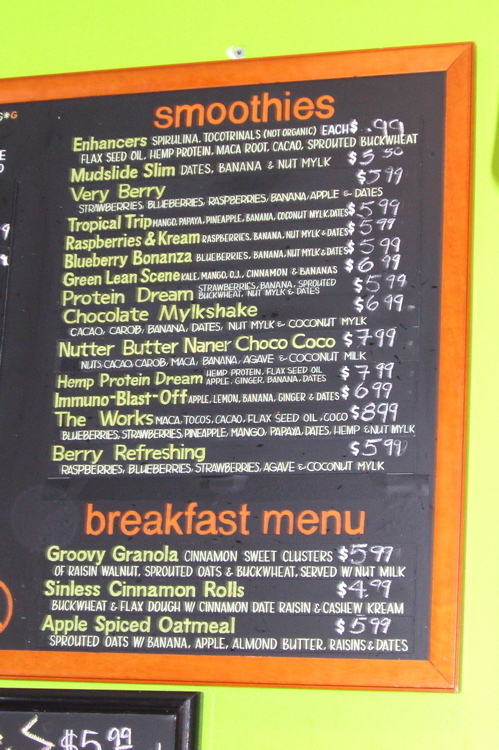 Instead, I decided to let Leaf redeem itself by trying one of their smoothies. I’m glad I did. I ordered the “Berry Refreshing” smoothie which has strawberry, blueberry, raspberry, coconut milk and agave nectar. It hit the spot, was super fresh, and managed to wash the tahini right outta my mouth. As far as I’m concerned, it is the sole reason I would ever consider going back. I would try some of their other stuff, but maybe as a salad instead of a wrap and definitely nothing with tahini. 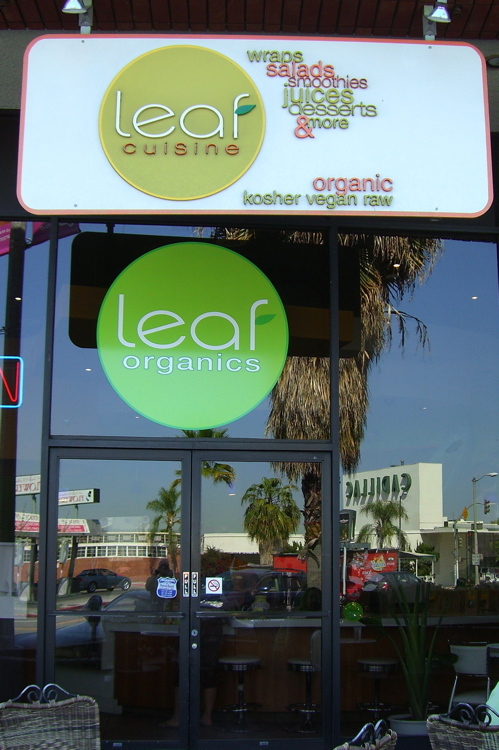 Overall, if you like really healthy food, I say give Leaf a try. You might like it, you might hate it, you may even use it as a form of punishment for your significant other. Whatever you do, for the love of god, stay away from the tahini. Also, on a side note, if I ever find the hippies on Yelp who so highly recommended said tahini, I will be leaving my own organic byproduct burning on their doorstep. Finally, since I always like to end each post on a high note, here is a picture of my sister. She’s obsessed with coconut. 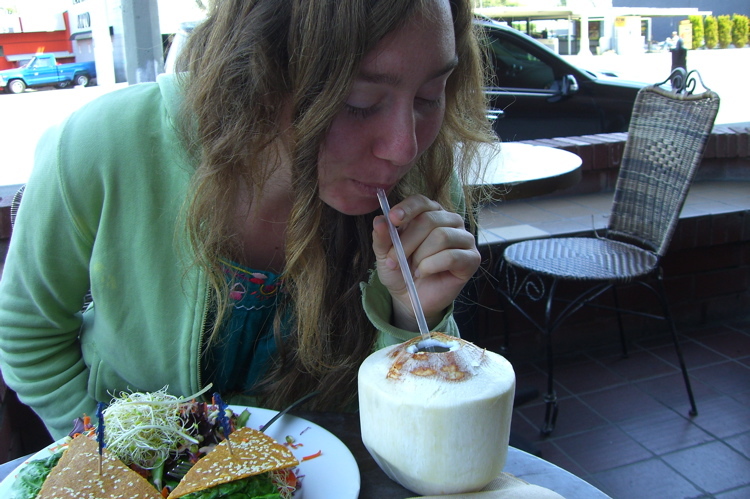 If you are obsessed with coconut too, you should go to Leaf. They have a ton of ’em just sitting there. Just walk in and do the pointer-finger-in-the-hoodie-pocket thing and they’ll cough ’em right up. Then proceed to the nearest getaway vehicle as quickly as possible to avoid any kind of police action. Ok, got it. Smoothies good, tahini bad. If I was going to take the time to try and picture what a raw food meal would look like, that wrap would pretty much be it. Ewww. You are a brave man. And anything called “unturkey” earns another ewww in my book. I’ll file this in the back of my restaurant folder under “child torture.” Thanks for the extra tool in my belt! Anytime Amy! It’s what we do.